Outrageous. If I was in Congress and was willing to provide federal financial aid for New Jersey, New York, Rhode Island and Connecticut, I’d outright demand not one dime be included in the bill that was not specific to storm relief. Of course, that won’t happen .. and the current bill provides $100 million for the federal government’s Head Start program among tons of other spending. My family has roots tied to the beach community just to the west of Misquamicut State Beach, to the east at Dunes Park near the Weekapaug Breachway, and to the original Ocean House in Watch Hill. My dad, my aunt and my grandparents along with a bunch of other family members were around during Hurricane Carol in 1954 which devastated the beach area and wiped out many houses all the way up to Beach Road. It’s somewhat obvious to those who know this spot, but the sand dune is GONE. Sandy was not nearly as bad as Carol, but from the video presented below, it looks like most of the sand dunes have been pushed north into Atlantic Avenue and all the way up to 1st Street. The tidal surge pushed all the way up to 2nd Street. 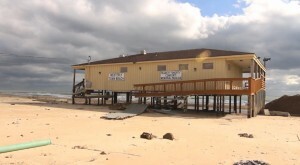 Misquamicut State Beach and the pavilion are pretty much destroyed. For all of my life, I can remember arriving at parking lots in the area to an obstructed view. You had to walk up the dune to see the ocean. No longer, you can see the ocean from Atlantic Ave. Here is some media video from Chris Walsh. I have some video from Fort Road in Watch Hill Village that I will try to post. All the dunes under and to the south of the cabanas have been washed out, temporarily providing boats in Watch Hill Cove an unobstructed view of the ocean to the south. Hurricane Sandy – Misquamicut Beach (Part 2) from Chris Walsh on Vimeo.